Use an Arduino to build the dancing toaster from the 1989's "Ghostbusters II". It may be too early to be making Halloween costumes, but this way, you'll have plenty of time make it, at least! This project was originally made for Halloween last year. With all the hype about the new Ghostbusters movie that was coming out at the time, I figured what better Halloween costume than a Ghostbuster! Of course, the jumpsuit wasn't enough for me, so I built the Dancing Toaster from the 1989 sequel! When I had the idea for a Dancing Toaster, I figured this project would be a good way to teach viewers about using solenoids! This project uses several solenoids triggered at various times to get our toaster groovin'. An Arduino was used for this project, but it really only contains simple code for triggering the solenoids. The strong power supply and the Adafruit motor-drive shield do most of the work. As you can see in the video, the Adafruit motor shield is pretty handy for driving solenoids. This could have been an analog project with individual buttons for each solenoid. Then you and your friends can see who can get the toaster to flip over first! The Arduino allowed us to get the toaster dancing without the inconvenience of continuously hitting different buttons. Some of my previous projects taught you how to use an Arduino, so for this project, we'll skip right to the nitty gritty. Solenoids are electromagnetic devices, for this project, are the driving force behind the toaster's dancing. A magnetic field is generated when voltage is applied to the solenoid's winding. Solenoids are designed to concentrate this magnetic field along the interior of the winding, causing the plunger to forcefully move when voltage is applied. The solenoids used for the toaster are designed for 12V. I used a hefty (8.5 amp) power supply to ensure that we have plenty of power available for the solenoids. 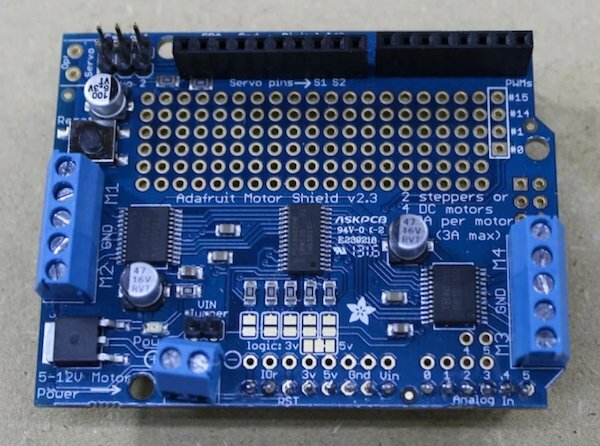 The Adafruit motor shield contains the high-current drive circuits that deliver power to the solenoids. Driving a solenoid isn't much different from driving a motor, that's why the motor shield works as a solenoid controller. The 12V supply is connected to the motor shield and the Arduino can be powered from a separate USB port or the DC barrel jack— as long as the "VIN Jumper" on the motor shield is 't connected. All we have to do is plug each of the solenoids into an M-port on the shield, which can drive up to four separate DC motors (or solenoids). The multipurpose Adafruit motor shield! To get a toaster that could jump around, I searched for the smallest and lightest toaster that I could find and didn't worry about the color (although the film's toaster is silver). The less weight that the solenoids have to fight against, the better your toaster can dance! To save money on components, I search through local second-hand stores for cheap props, abandoned toys, and components. The toaster was only $1.60. Choosing a lightweight toaster and fairly strong solenoids ensures that our toaster can get moving. I found a toaster with flat metal walls on the interior and an easy-to-remove bottom tray, to make installation easy. The Arduino code is straightforward and simple, it just turns individual solenoids on and off at different times. Attach some solenoids to a toaster and play around with the code to see which combination of solenoid triggers gives your toaster the most jump! Solenoids are useful components that are sometimes overlooked. They can do much more than bringing a toaster to life. 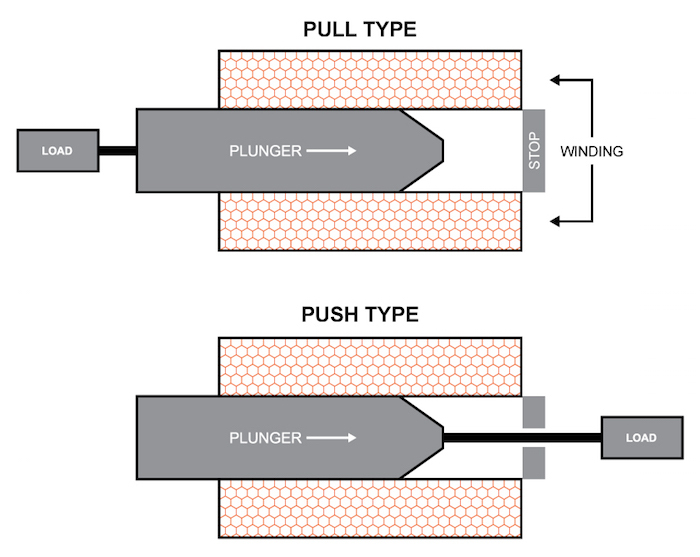 Solenoids can pull or push a mechanical load. They are found in various everyday machines and mechanisms: automated air and water valves, car door locks, mechanical doorbells, and even dialysis machines. 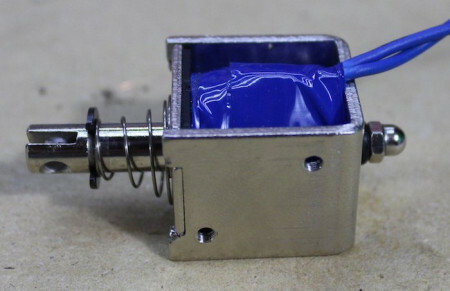 How Will You Use Your Solenoid? My love for solenoids lifts my toaster and me higher! While a toaster isn't a practical design, you can take this knowledge and implement your own design! Bonus points if you can incorporate solenoids into a Halloween costume! If your toaster starts moving without the help of electronics, who ya gonna call!? If you'd like to build something a little more practical with solenoids, check out these tutorials!